Her Weaknesses have turned into her Strengths! Since Amor could not hear songs the way we do, she naturally could not sing them correctly. She was so out of tune and her melody was so off. Nevertheless, I always cheered for her! Despite her hearing issues, I was so happy that she kept singing. Practice has truly made her singing perfect! As she has been overcoming hearing issues, her singing voice has developed beautifully! The greatness of her voice and her eagerness to sing, always gets her to sing solo in most of her school events! 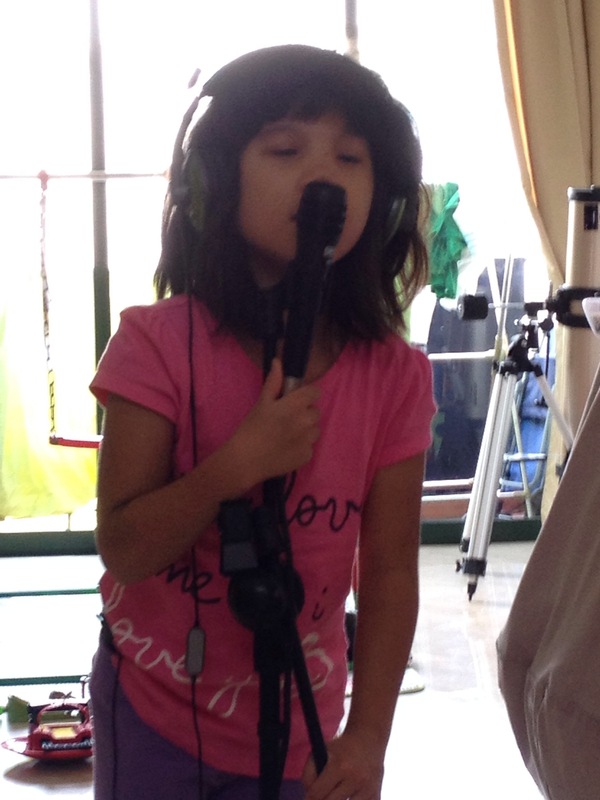 Yep, her determination can get her to be a great singer, if she wants. Amor has a speech delay. At age 3, she could only say a handful of words. Today, though she can engage in meaningful conversations, she is still not at par with her peers. However, she has an amazing ability to pick-up several languages. Last night she was singing the Chinese version is Frozen’s “Let it go”. She picked it up from YouTube and I’m pretty sure it was close to accurate. Back in Japan, she would response to our Japanese translator in Japanese! I had to ask and was told her answers were always appropriate. She also picked-up lots of Japanese from her classmates and used them appropriately. 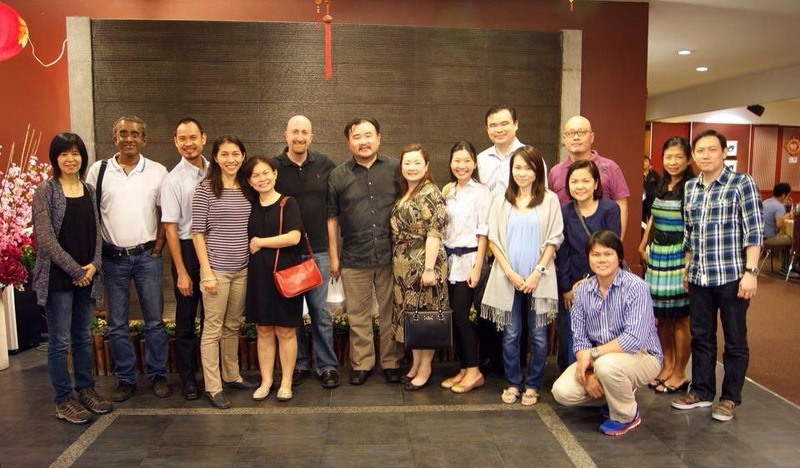 Here in Singapore, she quickly adapted to Singling. At home, she can translate what my husband and I are saying in Filipino. She has a potential career in Linguistics! She’s only 8 and already I know whatever she chooses to do in life, she will be amazing at it! We are so blessed to have found Son-Rise. Us seeing everything she does as beautiful, and not as a handicap, has certainly helped her overcome many challenges! God has blessed us with Amor! – our kids with Autism look at us with a sparkle in their eyes. – strong eye-contact soon follows. – our pre-verbal ASD kids speak for the first time. – verbal ASD kids start to converse. – our kids come closer to hug us spontaneously. – our kids express their desire to play with us. – we hear our kids say “I love you” for the first time. – our kids become spontaneous. – or kids become persistent. – we discover our kids have a great sense of humor. – our kids crave social interaction. – as social skills is developed, the foundation for learning is created. Learn more about it. Several Son-Rise Program® families will be sharing their experiences. They are all at various stages of their Home-Based Son-Rise Programs and implementing it at various intensities (i.e. from no fixed hours/lifestyle application only, part-time program to full-time program). All are seeing amazing progress in their children with autism! Can I just say, two of the Son-Rise moms who will be sharing, are medical doctors! 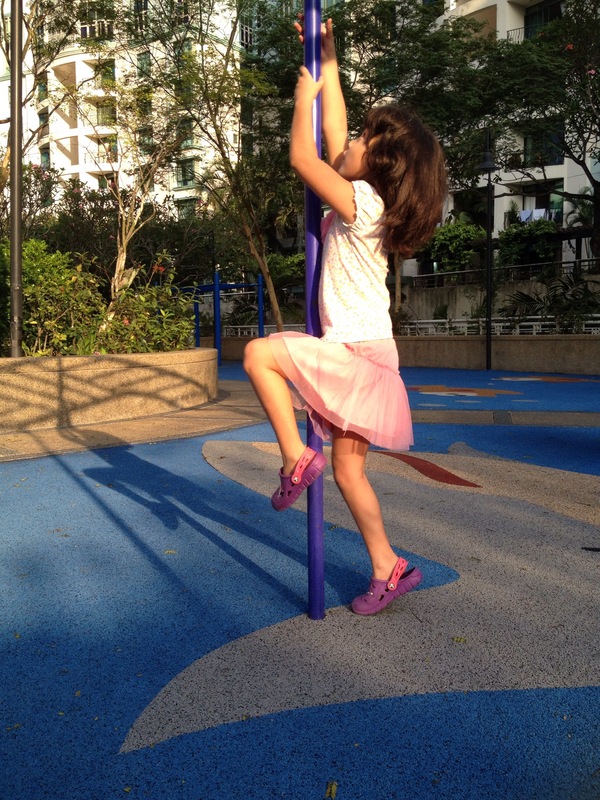 Bringing Amor to the playground is getting so much easier for me! Initially Amor would grab all the kid’s toys, scooters and bikes and shout, “MINE!” Guess how many kids must have hated her? Just this week, we were at the playground again and for that day, I didn’t feel like trying to control the world around Amor. I decided I would watch from a distance and see how she “fends” for herself. I was also ready to accept consequences, even a possible heartache,from someone bullying her, running away from her, ganging up on her, or telling other kids, “Don’t play with her!” or “Dont talk to her!”…Yup, we have experienced all those at some point in the past. So I sat back and watched Amor run to grab a scooter. With my eyes ready to roll, I told myself, “Oh boy, here we go again.” As predicted a girl came to rescue her scooter, hands on her hips, with a strict look on her face. I was too far to hear their exchange of words. But instead of stubbornly running off with the scooter, Amor dropped her hands and walked away. I think my jaw dropped when I saw that. Amor has always been stubborn enough not to care who owned the scooter and just run off with it. But wait…Amor walked back towards the scooter, held it and observed the owner come back with the same hand-on-hips and grin on her face. Woohoo!!! my daughter is not only learning, but also experimenting on reading social cues. She’s accurately reading social cues and making her own fantastic decisions on how to respond! From the reaction she got a second time, Amor decided to let go of the scooter and walk away permanently! Woohoo that’s my princess!!!! Because we have friends who come over to love and play with her and build relationship, Amor better understands the concept of friendship and what friendship is not. In the photo is Amor trying to climb the monkey bars, inspired by watching the other girls climb. Hurray! Really thank God. Nathan joined with us in music and movement. At first we let him flap his cardboard. Then he suddenly stood up and said, ‘I want to dance.’ He held my hands. So we danced and clapped hands. He is so happy. When Nathan’s doctor reviewed his brain scans at 2 months of age, he suggested Nathan may never walk. Nathan has cerebral palsy, affecting his brain’s ability to control his trunk and leg muscles. Look at a little stuntman today! 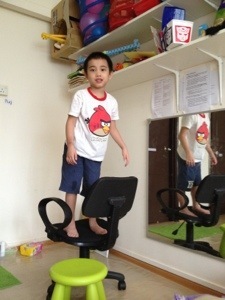 He keeps daring to challenge his balance. Never say never. There is more time for Nathan to learn to run, jump or even play soccer if he wants. When I discovered the son-rise program, I threw out all the rules that made me control Nathan’s movements and behavior. With Son-Rise, for as long as Nathan was safe, I gave him full control and allowed him climb chairs and stand on table tops. In a month, even his physical therapist said, “It looks like Nathan woke up new muscles.” His posture was much better. Nathan was happy today. He participated in our afternoon greetings time and in our story time. True enough, if you look at the picture, it really looks like an ant. I’m recalling Nathan’s first days of school, about 3 years ago, when he was so withdrawn as if there was no one else in the room with him. Then his special class a year and a half ago, when teacher had to keep reminding him (holding him down) to stay seated for circle time as he wander off ever few minutes. Or during sports day when he was picked to say something but he simply held the mic and licked it 😀 That’s son! And I love him! Wow! We’ve gone a long way, right Nathan? How many times do you have to acknowledge the good job done? Very early on, we were aware of Amor’s motor issues (stiff muscles) and were aware that she would be delayed in ability to draw and write. In fact, I was even worried about how far she would get with writing. But Amor is fighter. She loves to doodle with her crayons. Like an ism, we feel that her drawing is a way of “healing” herself and overcoming motor challenges. In a day, all her drawings would be no different from the previous. Yet with every new drawing we give her a “good job!” It indeed is a good job to be able to draw something recognizable when your muscles don’t move fluidly like other kids. With pride, we post her work (with Ian’s) on the wall. We don’t get tired of telling her that her new creation is better than the previous! All the “good job!” said is worth it! Amor, on her own, has finally written her name with no assistance whatsoever! I would never have imagined that this milestone would come this early. Thank you for looking at me! I love it when you look at me! Each “good job” will help him find his way out of autism. How Nathan regressed deep into autism and how we’re gonna find our way out. Nathan is still not walking but is talking in sentences. He knows ALL his nursery rhymes and easily picks up new ones. He can listen to mom spell and identify the words. Developmental Neurologist sees his eye-contact and dismisses “learning difficultly” prognosis…only walking was the problem. Nathan is still getting his pronouns wrong. Has a bit of echolalia. Nathan hums in between singing his nursery rhymes. Nathan starts to walk independently. The humming in between his nursery rhymes becomes longer and longer. Mom begins to wonder if those are blank moments. His attention span is short for his age. …but parents wait patiently for cognitive gains while enrolling him in PT, OT, The Listening Program, Aquatherapy. Nathan fails to acknowledge father’s presence (after living apart for a year to get access to more therapy). Nathan goes to summer school and is evidently in this own world. …but mom thinks: Why does it seem to be getting worse? He never learns to play with toys. He does not play with his siblings. He stopped singing songs and spends more time humming. He stopped describing things around him. He even stopped his echolalia. Stem cell injections – it did nothing for autism. Nathan’s cognitive level after Neuro. Dev. assessment: only 1 year 2 months. Less than half his age??? What happened? Despite intensive therapy, Nathan had become severely autistic. He wasn’t born with this autism. We found the Son-Rise Program! The best therapy for kids with autism and the best parenting tools for parents (with or without special needs kids). Nathan starts to bond with Papa again. maybe even a 3rd and fourth, especially with coaching. All these are emerging skills but I have full confidence this is the way out of autism. I speak with conviction because to date, 73 kids (some are teenagers) have recovered from autism with MMS. And the number is growing. Parasites, bad bacteria, yeast and viruses that release waste and decompose in kids guts release toxins which affect the brain causing autism. MMS kills all those. Nathan is on his way to recovery. It’s not in medical books. All those improvements came with free worms in his poop thanks to MMS. He started regressing from age 2 1/2. It’s been 4 years. I’m certain he’ll be a different person when we get all the junk out of his gut. I just have to add. I’m glad I found son-rise before MMS. It makes me a better parent understanding my child and his isms. And yes, I want his isms to go away as fast as possible but that does not make me love him less. And yes, even if Nathan does not fully recover…I will be grateful for all the love I have received because of him.